This is the trip of excess and the irony has not escaped me. My mother asked me the other day if I was losing weight. How would one lose weight in a country with more caloric food than a burrito stuffed with refried beans and loaded with extra cheese? OH! I got it….one can get food poisoning and even it all out. Chicken and mutton (type of lamb – the crap part). On the bone or off the bone? Spicy or dull? No cow here. It’s sacred. Naan – a type of pita bread. I prefer cheese. Jill likes garlic. You need Naan to scoop the piles of beans, vegetables, chicken, mutton or anything else on your plate into your mouth. The dishes are mostly in a thick flavorful sauce and the spices light up your mouth like a can of horseradish and red-hot chili peppers. Pappardum – a thin, crispy wafer with hints of black pepper. I am sure they have some purpose but because they bring them before the meal I crack it apart and nibble it like bread. Tea or Masala Chai – no coffee here unless you like instant or can find the Starbucks like chain Cafe Coffee Day, which is like a personal yet failed mission of mine. Lassi “cocktail” – In a country where alcohol is hard to find, I pretend I am sipping a fine wine by slurping on my new favorite beverage, a mix of yogurt and banana (think smoothie). This was highly recommended to me when I got sick and now I am fully hooked. Hindu women eat vegetarian in and out of the home where men eat meat outside of the home but rarely inside the home. The men are excused from abstaining from meat since it’s soooo difficult to find vegetarian on the streets (likely story). Most the men we met eat meat and even a few complained that their wives could not cook it well. Women learn to cook from their mothers at age 13 and if meat isn’t in the home, then that makes sense they are not learning to cook it. It seems men will need to fend for themselves. I like that idea. Indians are big into big. 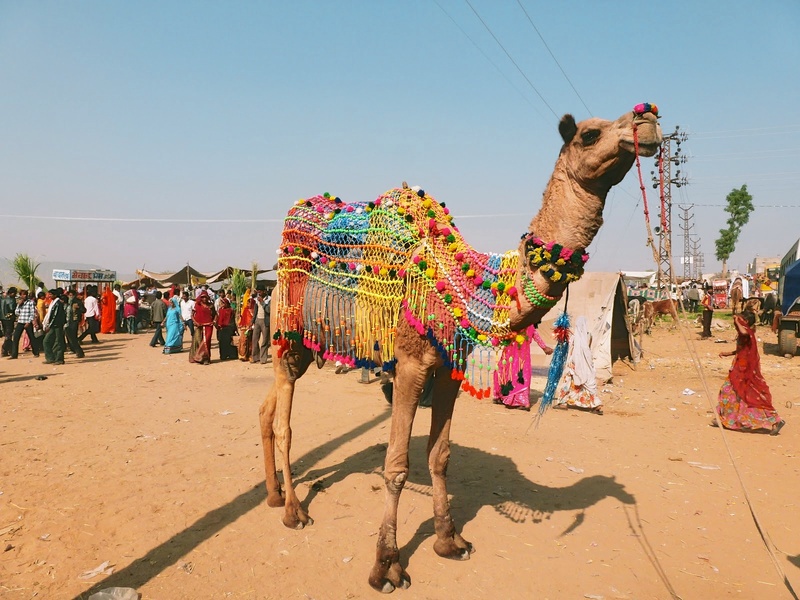 Whether it’s a wedding celebration, festival or religious ceremony, it’s over the top. 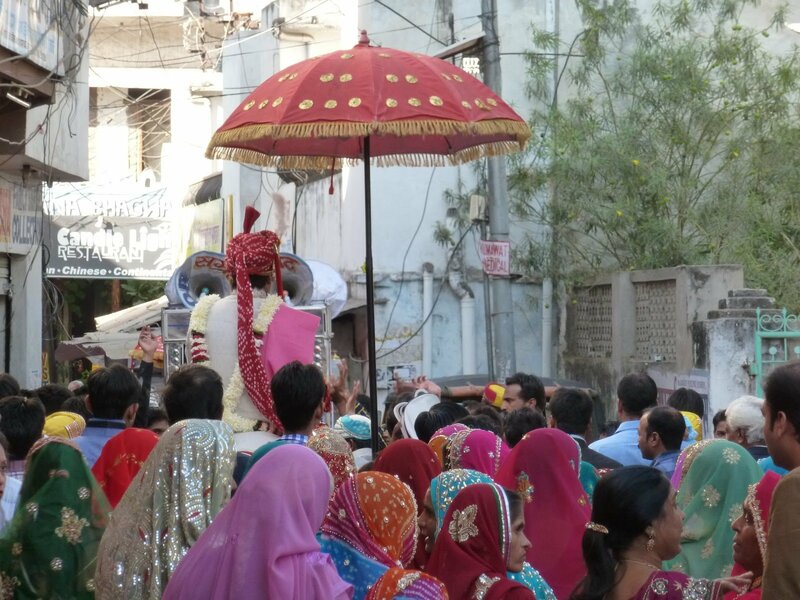 In Udaipur, we witnessed five weddings on the streets just today and the louder, the brighter, the better. There are festivals for a full moon, the stars, the monsoon, the Ganga, the cow and the bathroom (making sure you are paying attention). The most famous is Diwali, the festival of lamps that occurs from October – November and is celebrated all over India. During this festival, lamps are lit all over the house in the belief that wealth will not enter a dark house. I’ve decided I need a little bit of Ganesha and a whole lot of Krishna in my life maybe a little Lakshmi thrown in for good will. When I asked Jill if Ganesha was blue since my shopping habits scream, “buy blue.” She replied, Kelly, he can be blue if you want him to be blue.” Time to revert to the budget. As our driver Jayveer indicated one day, “we are like one family with many children” and I thought that was a great way to describe the blend of religions in India. They are all believers and we can either pay attention or get out of the way. Religion is embedded into every aspect of Indian life and I cannot help but embrace it. The people have Ganesha on a car dashboard, Vishnu on a statue in a park, Krishna monuments, and temples abound with these gods and many others. The jewelry (the ring), the scarves (last count 7), the bangles and the tailored shirts have now very surprisingly increased our luggage to an excess of 8 kilos combined. Let’s discuss that we may or may not have already shipped home TWO boxes to the states. In the land of excess where everything is on sensory overload, we really did visit another shop (to pick up our goods from yesterday) a mere four hours before our departure for Mumbai as if this was our last day on earth. Negotiating for more scarves, telling the shop owner they were gifts and pushing him for a better price seems absurd yet, it happened. When we returned to the car, I looked at Jill (who the shop owners have taken to calling “BOSS” and ignoring me) and said we are ridiculous and we erupted into giggles. And that there explains why we are staying in 3 and 4 star hotels instead of 5 star hotels. The difference in India is huge. “You go to tourist shop. Have a look around. Then we go to my shop with better prices” – Everyone has a shop. “She is naughty” – Naughty is used to describe a baby’s crying or bad sleeping behavior. It’s enduring. Southern India awaits and Visa has reported there is nothing more available for purchase. I always thought myself more Mike(dad) than Joyce(mom) but maybe spinsterhood has turned me into a shopper. We arrived safely at the Holiday Inn in Mumbai. I love American standards. The Holiday Inn is heaven–fresh sheets, clean, spacious, a glorious bathroom, CNN, LIGHTS, I could go on….I brushed my teeth in a sink with water and I may go crazy and shave my legs in this very luxurious shower. Alas, I can say oohlala!!! !